PandEcats.com is an online magazine, or more correctly called an "e-zine". PandEcats.com debuted on the web in July 2000 and now contains over 2000 articles dedicated to helping readers learn more about the breeding, grooming, showing, health, behavior and medical care of Persian and Exotic Shorthair cats. The information is invaluable to anyone involved in the cat fancy. A new issue of PandEcats.com is published twice monthly - on the first and third Tuesday of each month. All articles from past issues past are archived and available in our Subject Indexes. While most of our articles and pages are "free access", (available to all readers), each issue a few of our articles are reserved for our Members - those people who are more serious in their desire to learn more about their breed. Member articles require a username and password in order to access them. For information about joining PandEcats to become a member, CLICK HERE. EVERYONE is welcome to join and become part of PandEcats. Our members vary greatly in their experience and interests. Members include newcomers to the cat fancy and owners of national winning catteries; judges, breed council members and children in Junior Showmanship; veterinarians and researchers; people involved in feline rescue... and pet owners just wanting to learn more about their cats. 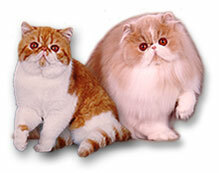 You don't have to own a Persian or an Exotic Shorthair. Many of our members actually have other breeds but still want to learn... and some of our members don't even own a cat (yet). From time to time, you will notice the reoccurring images of a cream and white Persian and a red tabby and white Exotic on the pages and in the titles of PandEcats. They are our mascots. The Persian is GC, BW NW Granddelight's PJ of Mockingbird. PJ was CFA's 2nd Best Cat in Championship in 1997. The Exotic is her son, GC Mockingbird X-Periment. Nicknamed Perry, he granded in style by being awarded Best Cat for his final points. He was never campaigned. These two kitties were the inspiration for PandEcats... and the foundation of the Mockingbird breeding program. Who are the people behind PandEcats? To learn more about the people behind PandEcats, check out our Staff Bios.